Prostrate forms of Saint John’s Wort plant, Hypericum perforatum, have the strongest hypericum. Hypericum has the effect of assisting in restoring damaged nerve tissue by deadening pain and strengthening the urinary organs. Approved by German Commission E as a remedy for anxiety, nervousness burns and wounds. Saint John’s Wort plant is native of the UK and Europe and prefers well drained, gravely soils in an open, sunny position. Frost resistant but drought tender. 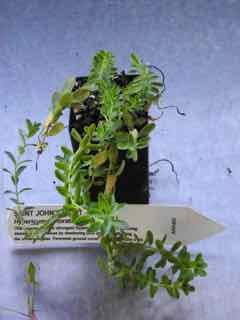 A perennial ground cover, growing to 0.2m x 1m. Flowers are bright yellow, with petals dotted with black along the margins appearing in spring and summer. Saint John’s Wort is also available as seed. Be the first to review “St John’s Wort, plant” Click here to cancel reply.